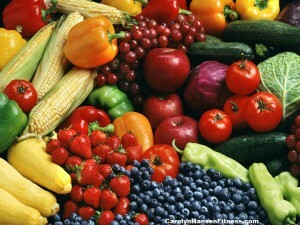 The ideal diet is one that is varied and supports a variety of fresh fruits and vegetables across the board. However there are certain super-foods within these groups that shine like the “morning star” in our quest for the “fountain of youth” because they offer such powerful anti aging properties. They should be included in our diets as much as possible. Leafy greens like kale and spinach are the hot trend these days for good reason. Rich in phytonutrients that prevent your body from free radical damage, these veggies also contain zeaxanthin and lutein that help prevent eyesight from deteriorating as you age. With calcium, folate and other important nutrients that support bone health, prevent age related eye issues and protect against cognitive decline, cruciferous veggies should be high on your list of anti-aging warriors. Diets sporting high concentrations of these veggies such as broccoli and cabbage have proven to reduce risk of cancer and cognitive issues like memory loss. Broccoli is rich in vitamin C and the sulforaphane in it helps to rid your body of damaging toxins by increasing the production of enzymes. Berries are rich in the antioxidant compound anthocyanins. This compound has been shown to improve brain function, muscle tone and balance and even slow the growth of certain cancers. Blueberries for example are one of the healthiest fruits you can eat in the war against aging. These blue beauties might be small is size but powerful in what they offer – the highest concentration of antioxidants of all berries. That’s not an easy title to win given the variety of berries in the world! They are also strong warriors in the fight against inflammation which ultimately leads to disease and aging and contain anthocyanins which is shown to improve memory and reduce the risk of Alzheimer’s disease. Certain verities of nuts such as walnuts and almonds contain healthy fats and a generous portion of vitamins and protein. They are also high in compounds that work to ease inflammation (which ultimately leads to more dangerous issues). Walnuts for example are near the top of the list when it comes to an all-around antiaging food. Packed with good fats, protein and a healthy dose of fiber the walnut is also the richest source of Omega 3 (Alpha Linoenic Acid or ALA) outside of salmon and other varieties of oily fish. Walnuts are a powerhouse of antioxidants that fight disease, essential fats to boost your brain power, a hormone to help you sleep better and anti-aging skin benefits along with a slew of other health incentives. The orange coloring of these three foods comes from the beta –carotene they provide us which offers healthy anti-aging benefits across the board from healthy eyes and skin to a reduced risk of disease including heart disease, osteoporosis and cancer. These orange beauties also contain high levels of vitamins A and C giving your immune system what it needs to stay strong and healthy. Like them or not, tomatoes are a must on any anti-aging list. An anti-aging powerhouse offering lycopene, an antioxidant compound that contributes to heart health and a reduced risk of disease such as cancer. Lycopene also protects against sun damage and wrinkles by preventing the breakdown of collagen in skin. Tomatoes are pretty much a staple in many diets and can easily be used in salads, sandwiches, soups, casseroles and wherever your imagination can take you. Cooking can actually help release more lycopene. Sundried tomatoes offer the highest level of this powerhouse antioxidant. Concerned about your ph balance? Look to the royal avocado. These green bumpy fruits can help balance your ph because they contain alkalizing components. With high levels of vitamin E, avocados are superfood powerhouses filled with anti-aging components. Rich in monounsaturated fatty acids (the good fats) they are great for heart health and help absorb nutrients. Both salmon and tuna are great tools against the aging war. Rich in Omega -3 fatty acids that are key to heart health and the prevention of age-related heart disease. Studies that examined the dietary habits and health of people who enjoy eating these superfoods on a regular basis have revealed that they were much healthier than people who don’t enjoy them.